TongaFootball > News > FIFA Women's Football > FIFA Live Your Goals hits Vavaú over the weekend! The objective of the FIFA women’s football development programme is to inspire young girls to get involved in this beautiful game, and for many it offers the first opportunity to kick a ball. The event is being spearheaded by the Tonga Football Association and the Vavaú Football staff. More than 142 girls aged between 6-16 years old took the opportunity with open minds at the Nippon Field, Neiafu, Vavaú. Hon. 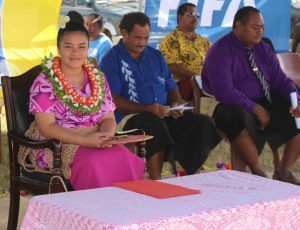 Veisinia Fulivai, daughter of Lord Fulivai, the Governor of Vavaú was the guest of honour in marking the rolled out of the FIFA Live Your Goal to the northern region of Tonga, Vavaú. She is only 16 years of age and currently a football player. ‘’If you wish to pursue your dream through football, go for it! That is Live Your Goals is all about,’’ she stressed out. The festival was considered a grand success with the smiles on the faces of the kids and the constant laughter a clear indication of their enjoyment, including a three year old girl. The Tonga Football Women’s Development Officer, Meleoni Uera emphasised on the FIFA Live Your Goals is aimed at promoting and empowering as many young girls as possible and to encourage more women and girls to participate in football. Children, especially girls from various football clubs in Vavaú came to participate in the program where they took part in two hours of football skills lessons taught by volunteers that assigned to supervise the young girls. 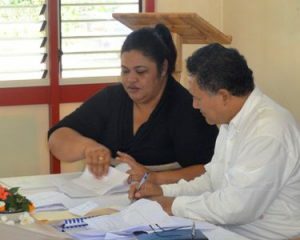 Tonga Football Association President, Lord Veéhala, said the programme was successfully rolled out in Tongatapu and now it is going to Vavaú. Tongatapu will be the next stop for the roll out and this should take place towards the end of November. This FIFA Live Your Goal activities were led by 34 volunteers and 24 of them were young women whom they currently coaches for their women’s football teams. It is a great chance for them to put into practice of what they had learnt over a one day workshop was led by Kilifi Uele, TFA Technical Director.